January is California Restaurant Month, a month-long, statewide celebration promoted by the state’s division of tourism. Hundreds of restaurants across California are offering special multi-course menus at incredible prices. 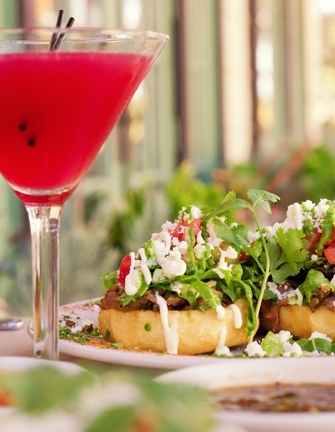 Order a pomegranate margarita, sit back, and enjoy the homemade sopes with carnitas and the Especialades Mexicanas at Dos Carlitos Restaurant and Tequila Bar in Santa Ynez during Restaurant Week, Jan. 20 through 26.. The Central Coast is no exception: Dine Out Santa Maria Style is Jan. 13 through 20; Santa Ynez Valley Restaurant Week is Jan. 20 through 26; San Luis Obispo County’s Restaurant Month is Jan. 1 through 31; and Santa Barbara’s Film Feast is Jan. 24 through Feb. 3. In the Santa Maria Valley, The Vintner’s Bar and Grill, The Garden Room Restaurant, Straw Hat Pizza, and Rooney’s Irish Pub are offering 15 percent off meal tickets during the week of Jan. 13, and Foxen, Cambria, Riverbench, and Byron wineries are offering two-for-one wine tastings. The following week, some of the finest restaurants in Northern Santa Barbara County will offer three-course tasting menus for just twenty bucks and change. Restaurants participating in Santa Ynez Valley Restaurant Week include The Ballard Inn, Avant Tapas, Starting Gate, Bell Street Farm, Los Olivos Wine Merchant and Café, Petros, Dos Carlitos, Trattoria Grappolo, The Willows, Fresco Valley Café, Hadsten House, Mirabelle, River Grill, Root 246, and Succulent Café. Two new restaurants were added for this year’s restaurant week: Solvang Brewing Company and Ranch & Reata Roadhouse in Santa Ynez. Dos Carlitos’ fresh halibut ceviche is served on a crisp corn tortilla with lime, avocado, guacamole, and salsa fresca. Or start with a memorable margarita mixed with premium tequila at Dos Carlitos Restaurant and Tequila Bar located on Sagunto Street in the charming Western town of Santa Ynez. 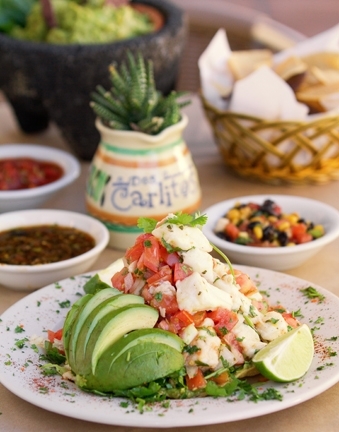 Dos Carlitos serves scrumptious upscale Mexican and Latin cuisine and more than 60 artisanal tequilas. The idea is that people will partake in an exclusive Film Feast prix fixe menu and tasting flight in Santa Barbara before attending a movie premiere at the film festival. Participating restaurants include Bistro 1111, Casa Blanca, Crocodile Restaurant, Downey’s, Enterprise Fish Company, Miró, and Rodney’s Steakhouse. The dinner starts with clam chowder or green salad, a choice of mesquite grilled Mt. Cook Alpine King Salmon; mixed seafood grill; live Maine lobster; or prawn skewers, followed by Enterprise Oreo Mudd Pie, creme brulee, or macadamia cheesecake. San Luis Obispo County’s sixth annual Restaurant Month runs all 31 days of January. At least 42 top-notch restaurants across the county are celebrating the region’s culinary diversity with three-course, prix fixe menus for $30 including Novo, Café Roma, Buona Tavola, Alex Madonna’s Gold Rush Steakhouse, Lido, Giuseppe’s, F. McLintock’s, Gardens of Avila, Cass House, Hoppe’s Garden Bistro, Artisan, Thomas Hill Organics, and Bistro Laurent. 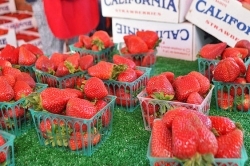 For a complete list of participating restaurants go to sanluisobispocounty.com. First course: cornmeal crab fritters, chorizo-stuffed dates, or stuffed piquillo peppers. Second course: organic farm lettuce salad with rosemary-chili walnuts, red onion, and shaved fennel; or spice-roasted beets with herbed goat cheese, pickled onions, and citrus salt potato chips. Third course: grilled sustainable fish with a Veracruz sauce; brick-grilled chicken with thyme-roasted tomatoes and winter greens; skirt steak arrachera and chimichurri; or pan-seared sweet potato gnocchi and roasted heirloom squash. As you can see, local chefs go all out designing enticing, affordable menus, in hopes that regular patrons, new customers, and tourists will return for more innovative, fresh, local cuisine during the rest of the year too. Sun food and wine columnist Wendy Thies Sell wants to hear about your favorite restaurant. Contact her with story ideas at wthies@santamariasun.com.